In September I wrote about the disappearing Citi Dividend card that you can only get by downgrading other Citi cards. The article is here, and I’m happy to report that Citi is still allowing downgrades to this otherwise obsolete card product! The bad news is that drugstores are not on the 2015 calendar, so it may take a little more time than it has in the past to max out the $300 that you can earn each calendar year. Today I want to look at our Chase card downgrade strategy and options available, as well as address some concerns I’ve seen voiced about downgrading Chase cards. I’m talking, of course, about the Chase Sapphire Preferred card. Is it good? Yes! Is it the best card for any situation? Rarely. In nearly every case beginners would be better off with a planned trip and the co-branded card(s) that will get them that trip. A simple domestic or Caribbean trip flown on Southwest? Southwest cards earn more miles for less spending, and the points count toward Companion Pass status. Looking or something on United or American? Same thing – UA, AA or BA cards will take you further for less. 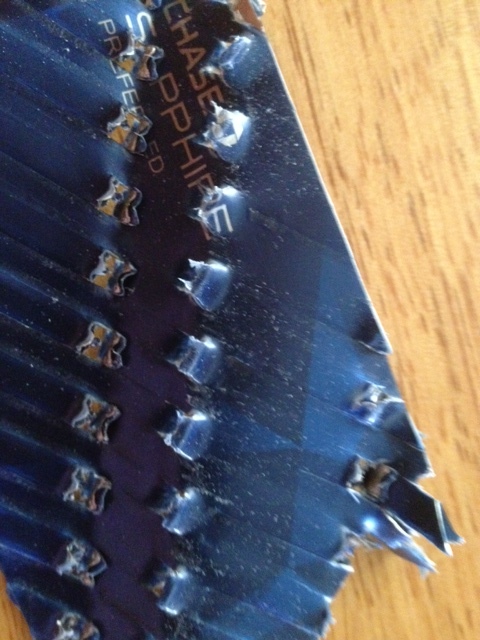 The Sapphire Preferred card should come, for most people, further down the line after a few other Chase cards. The Sapphire Preferred is, however, far superior if you’re looking to destroy an old paper shredder so you have a reason to buy a new one. Photo from Flyertalk member highops. Transferable points: You can keep your Ultimate rewards points until you are ready to book. These UR points are a great way to build up your travel savings account. Versatility is good! Car rental insurance: The Sapphire Preferred offers primary Collision Damage Waiver insurance, even in countries such as Israel, Italy and New Zealand that are often excluded by other cards. CDW insurance is usually not included in online quotes and can easily double the cost of a car rental. Double points on travel and dining, with Milesabound’s favorite promotion once a month. Simplicity: recurring charges are already on it, you have paid for items with it and you don’t want to have to switch cards, etc. Concierge service. Apparently there is one. I have no clue. Ultimate Rewards points (including those earned on cards without an annual fee) can be freely transferred between spouses/domestic partners as well as between personal cards and business cards. For transferability, there is NO reason to pay more than one Ultimate Rewards earning card annual fee each year. Several other Chase Visa Signature cards have the exact same insurance, including the United MileagePlus Explorer card. The no-fee Sapphire card also offers Primary CDW outside the U.S. EDIT: and secondary CDW (to your own auto insurance) within the U.S. The CSP or United card would be a better choice within the U.S. if you have only liability coverage on your own vehicle. The Sapphire card (again with no fee) also gets 2 Ultimate Rewards points per dollar on dining, and the Freedom card gets 5 UR points per dollar for one quarter’s bonus category! 1/4 of the year at 5X, or 1/30 of the year at 3X? You decide. Simplicity: We’ll get to that. It’s simple. There are lots and lots of cards with no FTF, including several other Chase cards as well as the Barclays Arrival card which (combined with MS) allows you to get discounts of 60% or more on the travel costs that can’t be paid for with miles and points. If you actually use the Sapphire Preferred concierge service, there’s a good chance you also have another card (AMEX Platinum?) with a similar service. Last, but certainly not least, the Sapphire Preferred is a churnable card, with churning rules that are perfect for a couple in two-player mode! A couple can easily take advantage of the benefits of downgrading, while keeping a Sapphire Preferred available for ~23 out of every 25 months, and earn far more points than any other way while never paying an annual fee! Chase Freedom also earns Ultimate Reward points at 1 per dollar on all purchases, and 5X on $1500 spending in rotating categories each quarter. Many people apply for this card for its own (up to) 20,000 points signup bonus, but you can have more than one and max out the 5X categories on each one! Chase Sapphire, the non-preferred version, has exactly the same double points on dining. And the same rental car insurance. It’s also a Visa Signature card so it retains all of the same purchase protections after downgrading. You might have to wait until the one-year mark to downgrade. I was able to downgrade mine after 11 months, Bonnie had to wait until a full year had passed from her Sapphire Preferred application. The annual fee never posted. Your account number won’t change. Your old heavy, metal card will still work! I have tried this with cards that have been downgraded to both Sapphire and Freedom, and they work perfectly! I don’t quite know how they pull this off since the expiration date on the new card is usually one year later than the original card, but at any store, restaurant, hotel or whatever where the card is swiped the old and new cards can be used interchangeably. I need to do a test at Wal-Mart to see if the downgraded Sapphire Preferred will still work on a chip transaction. just like it does every few years anyway. So if you use it at an online merchant, you will have to update the expiration date. Your aging account will help boost your credit score. This is a major reason to keep older credit cards going. Keeping the points alive is easy – downgrades to Freedom or Sapphire as well as downgrades from Ink Plus to Ink Cash will have no effect on the UR points you have earned. But downgrading will take away your ability to transfer directly from that credit card account to your frequent flyer account or hotel program. Option 1: Ink Plus or Ink Bold If you have either of these cards, or if either member of a couple gets an Ink Plus card, you can transfer points from any and all Sapphire, Freedom and Ink accounts and then transfer to either person’s frequent flyer program. The Ink Plus is the one UR-earning card that is worth paying the fee on for most households since the extra points earned on phone, TV and internet purchases will cover most or all of the $95 annual fee, and the 5X bonus at office supply stores can be leveraged into 5X or 5% earning on many everyday purchases. This new cardmember bonus offer is not available to either (1) current cardmembers of this consumer credit card, or (2) previous cardmembers of this consumer credit card who received a new cardmember bonus for this consumer credit card within the last 24 months. So the timeline would go something like this: January 2015 Dad gets a new Sapphire preferred card and meets the $4000 spending requirement by March. He downgrades his card in January 2016 after transferring any points to frequent flyer programs for travel to be booked within the next month. The rest of the points are fine in the downgraded account, and Mom applies for her card in February giving them a new account to transfer from. She downgrades her card in February, and 24 months and a week after his bonus posted in March, Dad can repeat the process. 40,000 bonus points per year while allowing you to use other cards for signup and category bonuses and other needed points! Option 3: Do both! Or, get on a schedule where you are also churning Ink cards the same way but a few months after each Sapphire Preferred churn. We haven’t had any success downgrading other co-branded Chase cards to Freedom or Sapphire, but it would be worth a phone call to try! If you have product changed any other card to a no-fee Ultimate Rewards earning card, I’d love to hear from you in the comments. Hello. If I have had the CSP since 2011, if I downgrade now, how long do I have to wait before applying for a new CSP to get the 40K again? Would I be better off just cancelling and then reapplying a few weeks after rather than downgrading? You don’t have to wait at all to apply for a new CSP because it has been more than 24 months since you got the bonus. I would downgrade rather than cancelling because it keeps your existing points alive and helps maintain age of accounts, gives you access to more 5X earning and preserves your credit which can be moved to other cards if needed. Thank you. When I downgrade, does Chase allow me to have both the downgraded card and a new CSP? Looks like I’ll be getting a new CSP. Does anyone on saverocity have links to it? Yes, you can keep both. Of course approval on a new card is never guaranteed but if you don’t have lots and lots of new applications, and have good credit, you should be fine. There are referral links available here http://saverocity.com/forum/threads/sapphire-card-referral.812/ on the forum, and I think there is also a link on Matt’s credit card page. I recommend allowing all Chase applications that are not instantly approved to go through the system normally rather than calling reconsideration on a pending application, unless you plan to apply for more cards the same day. Thanks, Kenny. The information on Sapphire was new and useful to me – especially the rental car insurance and account number not changing. Very timely as well as my CSP is due for renewal next month. Glad to help! If you check the CSP brochure on car rental benefits, it is for both the Sapphire and Sapphire Preferred. Of course the CSP should win by a little outside the U.S. due to foreign transaction fees, but at Hertz in Israel all charges were in USD anyways! I currently have Chase Sapphire and my car rental insurance is SECONDARY. Please correct your article. Thanks, I did clarify that like on the Sapphire Preferred, CDW coverage is seconday within the U.S. (where your own auto insurance is primary) and primary outside the U.S. The wording is identical. You’re right. They changed that in July, and I had missed that. My CSP annual fee was charged a few weeks ago, and I had been meaning to call and downgrade. Your article was a timely nudge. So I just called in “to consider cancelling”, and the CS agent immediately offered to downgrade me to the “no fee” Sapphire instead of cancelling. I asked about downgrading to Freedom instead, she said hold on a minute, and came back and said that was an option as well. So, a 5 minute call and downgraded CSP to the Freedom and will get a refund of the annual fee that I never intended on paying. Can you elaborate on getting multiple Freedom cards? I already have one. Don’t think I can get another one (and the bonus ) by applying; the only.way is to downgrade another card. No? You can’t get another Freedom card bonus unless you close or product change the one you have, and even then not until 24 months since you last got a bonus. You can, however, downgrade or product change other cards and wind up doubling (or more) your potential to earn 5X points on bonus category purchases by having 2 or more Freedom accounts. gocha. Great idea to downgrade and earn multiple 5x’s. What other cards besides CSP can be downgraded to Freedom? Thanks Carl, yes you should keep track of your application history! I’ll clean up a simple version of our spreadsheet and email it to you. Interesting article. Wondering why you suggest waiting on pending applications as opposed to calling the reconsideration line? Thanks. I definitely recommend not calling business reconsideration unless you get a denial letter, as their business phone agents seem to be a lot harder on businesses (both the tiny home-based business and the larger business) than the agents who process the app if it goes through the normal, slow channels. I have heard enough reports of personal reconsideration agents raising questions about the number of cards opened, or about spending patterns on Chase cards, to make me think the best approach is to wait, across the board. Our own results for business cards: 1 approval (after some grilling) and 2 denials when calling into reconsideration on a pending app, and 5 approvals with no phone calls needed when allowing them to be processed normally. Next post: AMEX to British Airways transfer bonus is back!